Review: L.A. Guns New Album The Missing Peace Out On October 13 - Welcome To All That Shreds Magazine! For you L.A. Guns fans, you’re finally going to have an album with Tracii Guns and Phil Lewis back together. ‘The Missing Peace‘ has Guns and Lewis. The rest of the classic line-up of Mick Cripps, Kelly Nickels, and Steve Riley isn’t on this album. The album gets better with songs like “Don’t Bring A Knife To A Gun Fight“. There are too many ballads on here for my liking. Tracii and Phil write good songs. For the L.A. 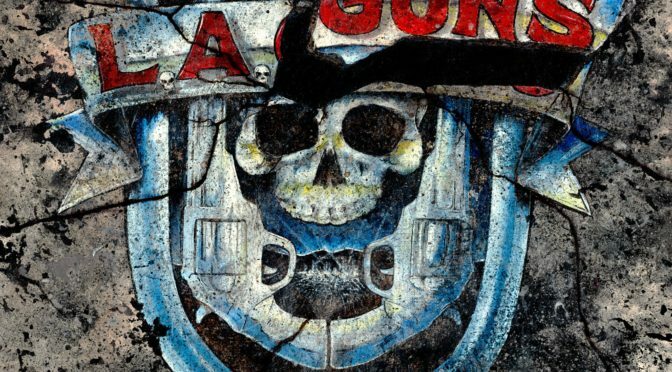 Guns fan, they’ll embrace this album and rock to it. Tracii Guns has immense talent. From a guitar perspective, I’d love to see him in a heavier band like an Arch Enemy just unleashing his fretboard abilities. Guns can be mentioned in conversations with names like Vai, Petrucci, etc. Tracii isn’t underrated, he’s undercelebrated in my opinion. The Missing Peace will satisfy all L.A.Guns fans. For us guitar nerds looking for him to ‘Rip and Shred‘, the wait will continue. 8/10 Rating.